Marketers today are fast shifting from thinking in terms of channels and audiences to thinking about sending personalized messages to customers, each with their own preferences, personal history with the brand and unique value to the brand. Experts predict that this shift will cause platforms that can deliver personalized creative at scale to become critical components of tomorrow’s marketing strategy. This is exactly what beacons help marketers do – connect brands with their customers at the right place, at the right time, with highly relevant and personalized notifications. Though beacons have now reached mainstream, most retailers today are still unsure about where to begin or how to integrate beacons with their marketing strategy. In their haste to catch up, a number of retailers end up making unsuccessful beacon deployment attempts. Lack of proper beacon infrastructure or bad UX in a beacon-enabled app can wreck even the most ambitious iBeacon campaigns. This is one of the main reasons why we generally focus a lot on offering guidance to our clients right from – why beacons make sense for their business, how to plan a beacon trial, ideas for setting up beacon campaigns, how to go about a beacon deployment etc. If you are just getting started with your beacon pilot or are already in the process of planning one, check out our recent webinar on ‘Your Guide to Planning a Successful Beacon Pilot’. It will help you understand the nuances of setting up a beacon pilot from scratch and set you up for success. 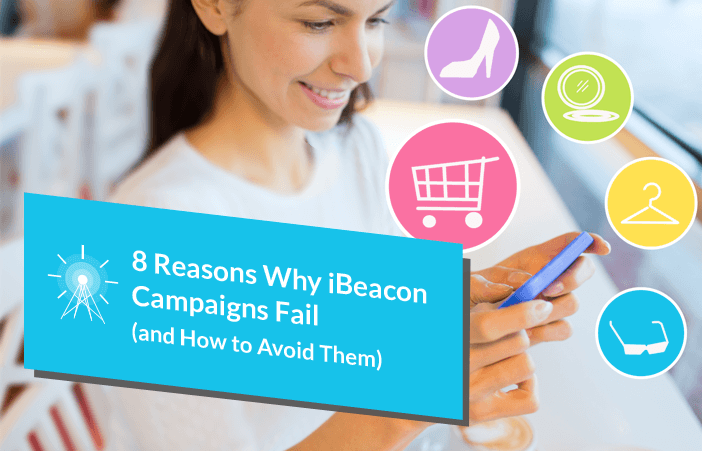 To help you get started with your iBeacon campaign, we have put together a list of eight common mistakes and how to overcome them. 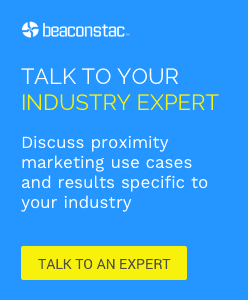 While beacons are great at enabling geolocation technology, unless your customers are educated about a genuine benefit, it’s highly unlikely that they will be interacting with it. According to a recent study, nearly 60% of users disable location services and push notifications for an app at public trials, when the reasons for such access are not made clear at the time of app installation. (a) iBeacon is the latest buzzword in the innovative retail technology space, so we need to implement a retail use case around it in some way. (b) Use beacons merely to push offers or discount coupons to all customers (without any pre-defined conditions) as they pass by the entry or exit of your store or a competitor store. (c) Use beacons to secretly track in-store customer movements. Solution – It is highly critical for your iBeacon campaign to offer a clear value such as deliver personalized and contextually relevant information (for example, pushing product demo videos that will educate the customer on the product in front of them and help them make the right decision) or help customers save on time by helping them navigate across the store and locate items on their wishlist. A proximity triggered push message can be part of that mix so long as it’s relevant to that particular customer. Also, according to preliminary data collected from a survey of about 200 customers negative experiences in the past further lowered the willingness among customers to share their location information. The key here lies in more nuanced guidelines that align the interests of retail brands with those of their customers and ensure that both parties benefit from personal data collection. We have blogged about practical solutions on how retailers can ensure transparency and trust, here. Most retailers, these days are in a hurry to run advertising campaigns after having run a quick beacon trial. It is highly critical for retail brands to analyse the results of the trial and take decisions for their future course of action, after running the pilot. Solution – Firstly, check the adoption rates. Did your customers bother to download the app? If yes, why? If no, why? It is highly important that you ask your customers for feedback on what they liked about their beacon experience and what they didn’t. Taking this into account will help you ensure that you don’t end up irritating your users with beacon-triggered notifications. You could also have a look at the analytics to check if the campaign resulted in an increase in footfall. Further, you could perform A/B testing with some product and location combinations within your store. This will help you optimize product placements and layouts. Find out what kind of messages worked for you and what didn’t. What kind of messages saw the maximum click through – you could use such messages more. Customers today interact with brands across a number of channels: in-store, online via mobile app, social media and more. In spite of having a good idea about this customer trend, many retail brands even today limit their interaction rules to a single proximity or location experience. The main problem here, lies in the inability of retail brands to utilize the existing information on a particular customer. For example, consider a scenario where a customer who just placed a click-and-collect order for a dress, walks into your retail store. And instead of helping her navigate the store to the counter where she can go and collect her order, you present her with a discount offer on bags. Such irrelevant offers and discounts can actually nudge customers to stop using an app or uninstall them, as it hardly adds any value to their in-store experience. Solution – The best way to go about this is to gather information from several touch points, both offline and online and match the content to the overall buying cycle. And no technology does this better than beacons. Retail brands can use these proximity detection devices to deliver a customer experience that will surprise and delight their loyal customers by delivering personalized messages based on the buying preferences, previous purchases and social media interactions of their customers. For example, when a customer enters the women’s section, you could use beacons to push offers on a beige shirt that goes with the trousers that she had bought earlier. Adding on to that, beacons can also help create a seamless connection between the brand experience offered to customers across each of your channels. While beacons can facilitate powerful personalized experiences in retail, chances are that the technology might fail when employed in isolation. Two of the main reasons behind this is that, customers generally tend to either turn off their Bluetooth or disable location services. According to recent research, over 30% of customers were found to have initially disabled their bluetooth services during the beacon trials. Solution – While beacons are currently the most popular indoor location technology among others primarily NFC, Wi-Fi, GPS, each of these technologies have their own limitations and retail brands need to use the right combination of two or more of them, in order to increase interaction reliability and provide a more consistent experience. For example, at instances where you want to be highly certain of the location of the customer within a venue, you can use beacons to handle those proximity-based interactions. Meanwhile, you can leverage Wi-Fi network to provide engaging navigational experiences within the venue and collect analytics based on those customer movements. Similarly when it comes to outdoor use cases or secure payments, beacons are best used in combination with GPS or NFC technology. One of other primary reasons behind the failure of beacon trials is that when it comes to designing in-store mobile experiences, most retailers today focus more on their needs than their shopper’s needs. This is mainly because most retailers today just proceed with a beacon trial, without defining the business goals or success metrics aligned with it nor and success metrics that or incorporating a testing agenda in their plans. Solution – The best way for retailers to ensure that their iBeacon campaign truly enhances the in-store experience, is to plan out the experience by putting themselves in their shoppers’ shoes. Additionally, retailers should also be constantly measuring and testing new offers and messaging in order to improve the performance of their beacon marketing programs over time. For example, metrics such as footfalls, visit frequency and recency, heat maps etc., can help you understand if your campaign is working or if it requires tweaks. Deploying too few beacons in-store does not allow for location-specific messaging as chances are high that the beacons might end up being too far from the shoppers to trigger a message. Solution – One of the factors that play a crucial role in determining where the beacons will be placed in the desired area of operation, is how the beacon will work with your existing application. For example, if you are planning on using your app to offer indoor-navigation then you will have to deploy a large number of beacons than in the case of proximity messaging. Either way retailers need to ensure that they deploy enough number of beacons to reach shoppers anywhere in the store, and collect some useful data about shopper traffic. Once you have decided on the number of beacons required, you will have to ensure that they are evenly spread out within the desired areas of operation. Most beacon pilots are generally built on simple content management platforms. While these platforms may be well suited for trials, most of them fail to scale in an enterprise setting. One of the main reasons behind this is that your beacon solution including the metrics, analytics and interpretation can’t exist as a silo. In other words, beacons, on their own, will only end up adding more and more data to your system. Solution – This is why enterprise architects increasingly insist on connecting external platforms with existing internal systems. That way all the information collected will be contributed to a common data store, thus accounting for a single customer view. This can be done by ensuring that your beacon solution is well aligned with your current marketing strategy that may include a CRM, loyalty program, e-commerce platform, POS system and a mobile strategy. This way, once integrated, beacons can help you distinguish between the three domains – in-store, mobile, online – that are, today, highly disconnected due to limited integration capabilities. This can be quite a daunting task for most app developers and digital agencies. While most of them tend to generate a lot of early excitement about the hidden potential lying in beacons, they eventually fade into drowning in a systems integration nightmare. This is where platforms like Beaconstac come into the picture. These platforms have pre-built adaptors that already connect directly into these systems make integration quick and simple. Of recent there have been a number of massive data compromises in the market which in turn have raised awareness of security and need for strong privacy controls. Sadly, not many iBeacon trials have been architected with security and privacy as an essential condition. Further, retail brands operating out of the European Union are subject to the Data Protection Directive which provides a robust mandate for managing personally identifiable information, including location activity. Solution – One of the best ways to ensure beacon security is to encrypt the major and minor numbers frequently on a timely basis. In addition to that, when it comes to advanced beacon solutions you will need an enterprise caliber software platform to simultaneously change the value of the UUID along with that of the payload. We have blogged about various other ways to asses beacon security and privacy here. Do you have any campaign ideas in mind that you are not sure about? Get in touch with the team here at MobStac and we will be happy to help you succeed at your campaign. If you are planning a beacon pilot, take a look at Beaconstac, that includes everything you need to get started. Using Beaconstac you can set up your own campaign, without a developer’s help! iBeacon vs NFC vs GPS: Which Indoor Location Technology will your Business Benefit from?